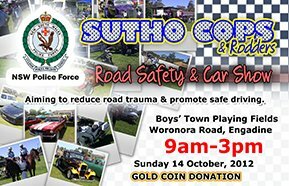 MRTeam is proud to be a sponsor of Sutherland Local Area Command’s 2nd annual ‘Sutho Cops & Rodders Road Safety & Car Show’. This educational festival will be conducted at Boys’ Town Playing Fields, Woronora Rd, Engadine on Sunday 14 October 2012 between 9am and 3pm. MRTeam will be on display with our race cars and custom built race car transporter alongside the V8 Supercars and other sponsors of the event. The aim of the event is attempting to target young, inexperienced drivers in order to try and reduce road trauma by providing education in the promotion of safe driving and display exhibits of the severity and the impact of major motor vehicle collisions has on family, friends and the community alike. The event has drawn in all relevant stakeholders that attend, rehabilitate and assist in road trauma from the initial scene through to the final stages of the patients trauma. Sutherland LAC’s 2012 event has received national interest from organisations such as V8 Supercars, V8 Utes, Shannons Insurance, NRMA Insurance, Sydney Motorsport Park, NRMA Safer Driving School, Careflight. NSW Police Force Crash Investigation Unit and Forensic Services Group will display the severity of motor vehicle collisions. Police Rescue and Fire & Rescue will conduct mock rescues at a serious motor vehicle collision. Stakeholders such as Brain Injury Association, Australian Red Cross, Donate Life, NSW Organ & Tissue Donation Services, Vision Australia, Transplant Australia, Wheelchair Sports NSW, Kid Safe will be attending with static and visual displays. Road Safety and entertainment planned includes and is not limited to Shannons Insurance Super Rig, Orrcon Steel Simulator, RAAF Military Dog Unit performing around an obstacle course and 'rings of fire', Australian singer/songwriter Helen Barron will perform a 'Thank You' song with more great hits, while Australia's best AC/DC tribute band, 'Dirty Deeds' will rock the house down with riffs from one of Australia's greatest band. Children will further be entertained with amusement rides and emergency services displays. NRMA Mobile Member Centre will be attending along with their vintage cars. Guest speakers include V8 Supercar Orrcon Steel Racing Team V8 Supercar driver Mark ‘Frosty’ Winterbottom. Australian Motor Racing Hall of Fame and legend, Jim Richards and V8 Utes Jesus Racing Team and driver Andrew 'Fishtail' Fisher. Road Safety expert and media personality Ian Luff will be presenting along with Ron Delezio, father of road victim Sophie Delezio. NSW 'Speedblitz' Blues players will also be attending. A large media presence has been arranged with Live! national TV in Weekend Sunrise and further film and news crews and a number of professional photographers from various magazines and newspapers. A large contingent of various disciplines of race and drag cars will be displayed, with Top Fuellers, Funny Alcohol, Group A's, Formula 3 to name a few. CAMS and other race officials will attend assisting patrons that want to 'take speed off the streets' with any enquiries that potential drivers may have to be involved in motor sport.